** Originally published in the Spring/Summer 1998 issue of the Crabbet Influence magazine. The word ‘Crabbet’ conjures visions of the gaudy, flaxen chestnuts preferred by Lady Wentworth but the Blunt legacy also came in other shades and types. The elegant bays and browns descended from Queen of Sheba and Azrek were one inheritance whose survival owes much to breeders outside Crabbet Park. Once upon a time Lady Anne and Wilfred Scawen Blunt decided to found a stud farm of pure Arabian horses. They visited the desert tribes and the Royal stud of Ali Pasha Sherif in Egypt and bought many horses of various strains and types. 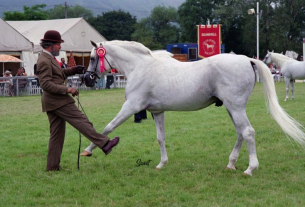 Today’s Arabians carry lines to many of these early imports but the emphasis on a small number of sire and dam lines has progressively narrowed the variety of types actually visible, especially in those animals of straight Crabbet breeding. QUEEN OF SHEBA. 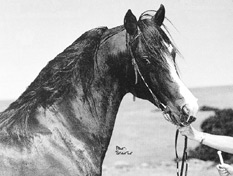 Brown mare purchased in the desert in the autumn of 1878. Both photos (Queen of Sheba and Azrek at top of page/article) from The Crabbet Arabian Stud, It’s History and Influence by Archer, Pearson, Covey. Alexander Heriot & Co. Ltd. publisher. Queen of Sheba and Azrek were important horses to the early history of Crabbet but, although their names are laced through many modern pedigrees, the type of fine and flamboyant bay they represented is much rarer. They are bound together by more than a place in history as the few descendants who seem to owe them a significant debt do so predominantly through their joint son Ahmar. There was also a full sister to Ahmar, Asfura, but Queen of Sheba’s influence breeds on more strongly via her other son Astraled. Azrek has a few other significant if not numerous lines of descent via Nefisa’s son Nejran, Rose of Sharon’s son Rafyk and Rose of Jericho’s daughter Rose Diamond. Queen of Sheba was a dark bay mare with four white feet and a star and snip on her face, known for her flashy way of going. She was tall for a desert bred mare, at 15hh, not classically pretty by modern standards but refined and somewhat light of bone. Her bay and dark chestnut descendants tend to inherit moderate to little white, a fine smooth look and significant style. Some of the most distinctive representatives of Queen of Sheba are to be found in the horses of Riffal breeding in Australia, a horse who carried a double cross to Astraled. Astraled, by the white legged Mesaoud, was a tall brown horse with no white and was very much Queen of Sheba’s son. The Riffal horses are tall bays or browns with very little white, not usually pretty, but with a dry refined look that refuses to be described as plain. Azrek was a compact, short backed and smoothly made horse who is best remembered for his action. He was also one of the prettier of the early imports with a short wedge shaped head and a well set if rather thick neck. The Blunts descriptions of him as a youngster in the desert tell us that, underneath the grey, he was bay. Indeed, in the long term, Azrek’s descendants were entirely via his bay progeny due to the fact that he was born into an era with a general prejudice against greys. Later, when his descendants were predominantly bays, Lady Wentworth’s preference for chestnuts and the Skowronek greys almost obliterated the Azrek type from the Crabbet gene pool. Ahmar was by far the most prolific of the Azrek progeny and most of the other lines were combined with him in the cases where the Azrek look has survived. This means that there is considerable difficulty in differentiating between the traits owed to Azrek or Queen of Sheba. Ahmar himself was more like his sire as a body type than his dam but was more than capable of throwing the brown and breedy look so reminiscent of Queen of Sheba. This mix of the two lines is largely responsible for the survival of a very distinctive look that crops up in England, Australia and the USA. The Ahmar type is a smaller than average bay, finely made, compact and pretty. They also usually display considerable style and movement. The family of the mare Farette, in England, is typical of this type. 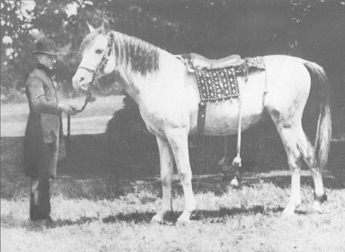 NEJIBA (1892) (Azrek DB x Nefisa) gray mare. This Azrek daughter has no descent today although her bay brother Nejran survives through his daughter Rish. Photo from The Crabbet Arabian Stud, et al. This was not the type for which the heyday of Crabbet Park was predominantly known and every generation has had its casualties. A browse through the photos of the past discovers many enchanting images. Nejran’s grey sister Nejiba was a compact and pretty mare, very much like her sire Azrek. She was given as a wedding present to Lady Wentworth, bred a few foals, only to be taken back and sold. Her line has long since vanished. 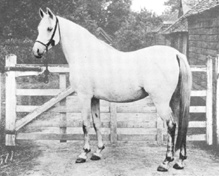 Asfura’s brown daughter Abla was one of the few to remain with Wilfred Blunt, after his daughter claimed the stud, while the last bays and browns from the line of Abla’s daughter, Arusa, were sold abroad. Ahmar’s daughter Selma was bred twice to Astraled to produce the mare Selima and the stallion Sotamm, both well thought of in their day. Nonetheless the majority of Crabbets inherit these lines via Oran (in Sotamm’s case) or the Sharima family (in Selima’s), horses that were big bold chesnuts rather than finely made, almost black, bays. Modern horses that carry a distinct inheritance from these old types pop up in both Crabbet and Egyptian lines. Tall bays, browns and even blacks that are smooth and fine, if not pretty, owe much to Astraled. The smaller, prettier Ahmar inheritance is also found all over the world, together with a few compact Azrek related lines in other colours. Indeed Azrek’s type appears to be less colour linked than Queen of Sheba, if you are able to divorce him from Ahmar. One such horse was Abu Zeyd (called Lal-I-Abdar in England). He is most often associated with his sire, Mesaoud, probably because of his colour. However, as with Ahmar, if you imagine him coloured in grey, his debt to Azrek becomes much more apparent (like many Azrek progeny, his dam was actually bay). Certainly his reputation for producing lovely short, deep heads was a distinctly Azrek trait. His legacy is still to be found in some of the Doyle and CMK Arabians in the USA. The chestnut line most often associated with Azrek is that of the mare Rissla in England. This is predominantly a legacy of movement however, although Rissla does occasionally contribute to the survival of a more Azrek type, in combination with other lines. Her own looks are usually associated with her Rodania female line. The one notable case where Rissla has been combined with other Ahmar blood, and seems to have reinforced that look, is the family of Farette. Farette carried two close crosses to Rissla plus two further lines to Ahmar, via her grandam Shabryeh, and this is the type that she is known for. She was a small bay with fine, smooth lines and extreme movement. The dry, desert type, the movement and the bay colour are all remarkably persistent traits with Farette’s sons Fari II and Bey Shadow both leaving a strong legacy plus elegant contributions from daughters such as Farosa, family group winner at the AHS National show. In U.S. pedigrees, the type seems to be owed to the Astraled granddaughter Ferda, of Kellogg stud fame, and the Ahmar granson Berk. The latter enters many CMK pedigrees through his daughters and half sisters bred at Maynesboro. This branch of the Queen of Sheba type is often buried by the use of Rodania, Nasik and Skowronek line stallions, but not always. The Queen is obviously alive and well in the USA as well. PERSIMMON (St Simon x Kazra by Mikeno) inherits his type from the Berk daughter Safarjal, foundation mare of the Courthouse Stud. Bill Clarke’s Courthouse stud, in England, was founded with mares such as the double Ahmar bay Safarjal (like Rissla she was sired by Berk). Her son Sainfoin was bred back to other Berk daughters such as Rangha and mares from the Bereyda line, full sister to Berk’s dam Bukra. In short, many of the Courthouse horses were intensely bred to Ahmar. In the stud’s last days the little bay St. Simon sold to Brazil for a, then, unprecedented sum. Fortunately a few precious foals were produced before he left including Persimmon (from Kazra), a champion sire who often passed on his colour, type and movement. In Australia the Sotamm grandson, Raisuli, has proved an important contributor through just a few daughters. They carried multiple lines to Azrek via Ahmar and Rafyk. Several of these daughters ended their days at Mrs. Maclean’s Fenwick stud where they were bred predominantly to Rakib, a grey Skowronek grandson with close lines to both Berk and Selima. Many of these favoured the grey Skowronek look of their sire but nonetheless were more than capable of throwing back to the pretty bay Ahmar/ Azrek type in some of their progeny. Baz (Skowronek x Barada II by Raisuli) produced his fair share of pretty bright bays, such as the lovely mare Finvola (from Florizelle). Rakib himself produced the lovely bay mare Helawi (from Carlina), who seems to have taken after Rakib’s own dam, Rythama, an elegant bay grandaughter of both Selima and Berk. Most of these Fenwick mare lines were bred to Riffal at one time or another. Riffal was a very tall, smooth horse (some 16hh records claim). He was dark bay with very little white and a double cross to Astraled much in evidence with one line to Ahmar not so apparent. A prolific sire, known by many for the combinations produced from his daughters bred back to the *Silver Vanity son Sindh. This is probably more of a comment on the heavy use of Sindh than any indication that he did not work well with other bloodlines. BANDOM (Banderol x Domtif) bay stallion. Sire of many champions in Australia. J. Martens photo from Australia’s Crabbet Arabian Horse Annual 1990. One of the superstars of the Sindh/Riffal cross was the bay stallion Banderol, a good show horse and outstanding sire. He was the most extreme version of the typical look of these bloodlines, being tall, smooth and refined with the long, arched neck normally only seen in paintings. He sired a sleek, elegant type that won many championships for the Arabian Park Stud where he resided. AKHU (1970) bay stallion (Remembrance x Kai) A winning show horse under saddle and champion sire in Australia. A straight Crabbet with 3 lines to Riffal. Pat Slater photo. Riffal’s sire Naufal was kept at Crabbet all his life but his progeny were not retained. Riffal himself was bred at Hanstead in fact. His blood eventually returned to Crabbet via the big, powerful chestnut Oran, who was a very different type. Naufal’s only Crabbet daughter to breed on was the mare Rishka (from Rishna by Nureddin II). She did not remain at Crabbet but went to Ireland where she was bred to Radi and Rissla’s son Irex. Her bay son Risheem (by Irex) went to Australia where he has a small but quality group of descendants, although they are mostly greys of a more Skowronek type. His full sister Wardi most closely resembled Naufal and a thin line of descent is hanging on from her in England via her daughter Wadiha (by Naseel). Wadiha’s full sister, Katina, was a successful broodmare for the Lewisfield Stud in the USA but the type does not seem to have survived to the present. 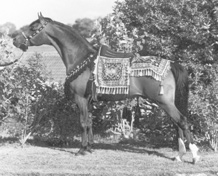 SERR HALIMA (1972) (Ansata Ibn Halima x Serrasab) bay mare. 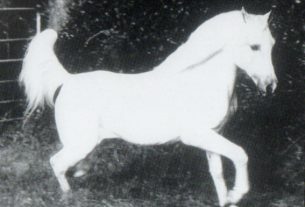 A straight Egyptian mare who inherits color and type largely from her five lines to the Crabbet stallion Sotamm, via Nazeer and the Babson imports. Naufal’s sire Sotamm and half brother Kazmeen were both sold to Egypt. They were not prolific but their contribution was significant. 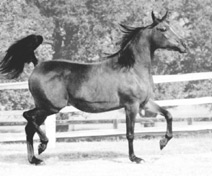 The Old Egyptian imports made by Henry Babson to the USA in the 1930’s included two fine, breedy bay mares. They were Bint Serra, a Sotamm daughter (whose dam was bred by Lady Anne Blunt at her Egyptian home at Sheykh Obeyd), and Bint Bint Sabah, a Kazmeen grandaughter. Small, smooth, refined bays, browns and blacks continue to pop up wherever the Babson Egyptian blood is used, even making it over to England via the imported stallion The Shah. The Egyptian state stud (EAO) is best known for the meteoric success of the progeny of the stallion Nazeer (Mansour x Bint Samiha by Kazmeen), but he passed on a distinctive type all his own. The Kazmeen grandson El Sereii and his son Tohotmos continued the compact, bay look of Sotamm, however, and the Nazeer line has had some stunning results that revert to this type when combined with the Babson bays. A thin line to Astraled’s son Rustem has also survived via such horses as the big, black and extremely athletic Gharib, sold to Germany. This horse shows certain similarities to some members of the Riffal progeny in Australia. We think so often in terms of separate bloodline groups that it is easy to forget how close the relationship between them often is. It would be a mistake to expect these various families to be identical to each other. Over the generations they have been combined with different lines and this, and the various priorities of the breeders involved, has grafted different traits onto the underlying legacy. In Egypt it was the fineness and the smoothness that was emphasised, in England style and movement while, in Australia, the taller reachier look of the Astraled line was stressed through combinations with sires such as Sindh. There are certain themes in common, however, which owe a significant and visible debt to Queen of Sheba and one of her most successful mates, Azrek. These themes are a definite, dry refinement, flamboyant style and a distinct family look, usually bay, that defies analyis. Queen of Sheba and Azrek were a formidable combination in their day and now, over a century since they were foaled, the legacy still lives on.